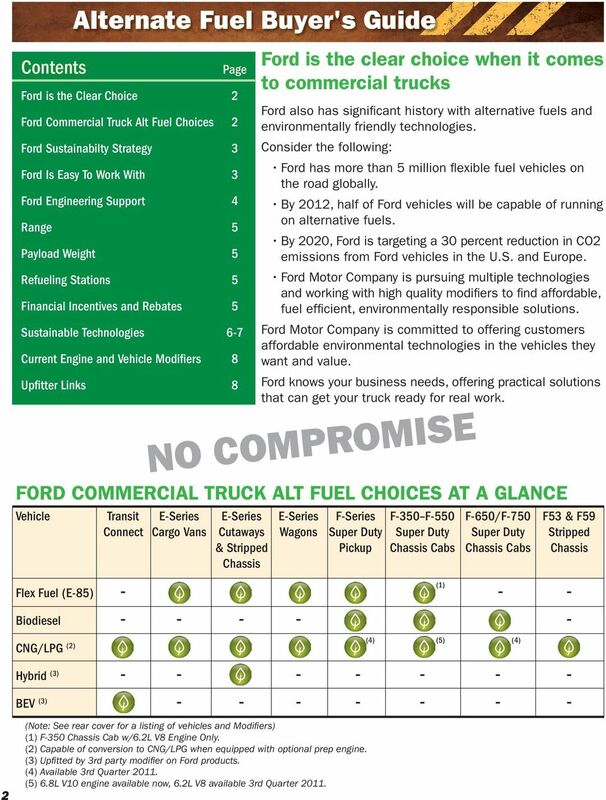 Download "FORD COMMERCIAL TRUCK ALT FUEL CHOICES AT A GLANCE"
2 2 Contents FORD COMMERCIAL TRUCK ALT FUEL CHOICES AT A GLANCE Vehicle Transit E-Series E-Series E-Series F-Series F-350 F-550 F-650/F-750 F53 & F59 Connect Cargo Vans Cutaways Wagons Super Duty Super Duty Super Duty Stripped & Stripped Pickup Chassis Cabs Chassis Cabs Chassis Chassis (1) Flex Fuel (E-85) Biodiesel CNG/LPG (2) Page Ford is the Clear Choice 2 Ford Commercial Truck Alt Fuel Choices 2 Ford Sustainabilty Strategy 3 Ford Is Easy To Work With 3 Ford Engineering Support 4 Range 5 Payload Weight 5 Refueling Stations 5 Financial Incentives and Rebates 5 Sustainable Technologies 6-7 Current Engine and Vehicle Modifiers 8 Upfitter Links 8 NO COMPROMISE (4) (5) (4) Hybrid (3) BEV (3) (Note: See rear cover for a listing of vehicles and Modifiers) (1) F-350 Chassis Cab w/6.2l V8 Engine Only. (2) Capable of conversion to CNG/LPG when equipped with optional prep engine. (3) Upfitted by 3rd party modifier on Ford products. 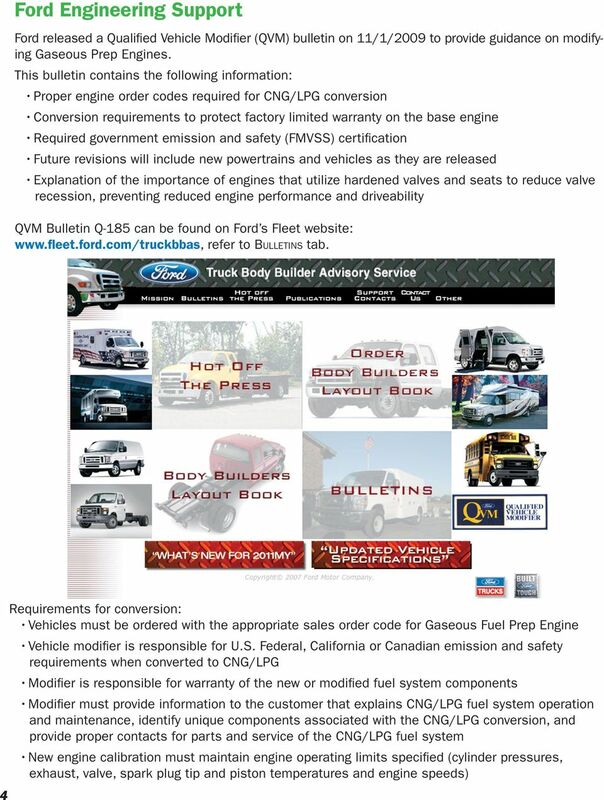 (4) Available 3rd Quarter (5) 6.8L V10 engine available now, 6.2L V8 available 3rd Quarter Ford is the clear choice when it comes to commercial trucks Ford also has significant history with alternative fuels and environmentally friendly technologies. Consider the following: Ford has more than 5 million flexible fuel vehicles on the road globally. By 2012, half of Ford vehicles will be capable of running on alternative fuels. By 2020, Ford is targeting a 30 percent reduction in CO2 emissions from Ford vehicles in the U.S. and Europe. 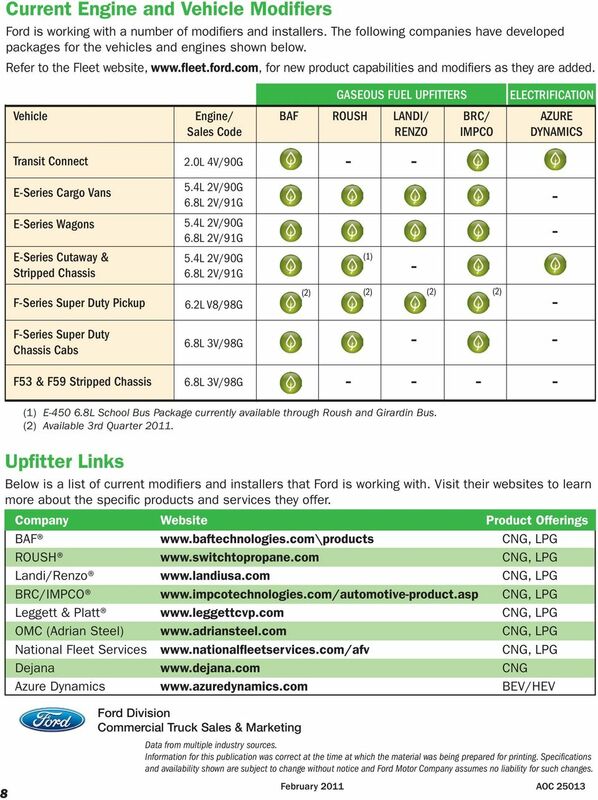 Ford Motor Company is pursuing multiple technologies and working with high quality modifiers to find affordable, fuel efficient, environmentally responsible solutions. Ford Motor Company is committed to offering customers affordable environmental technologies in the vehicles they want and value. 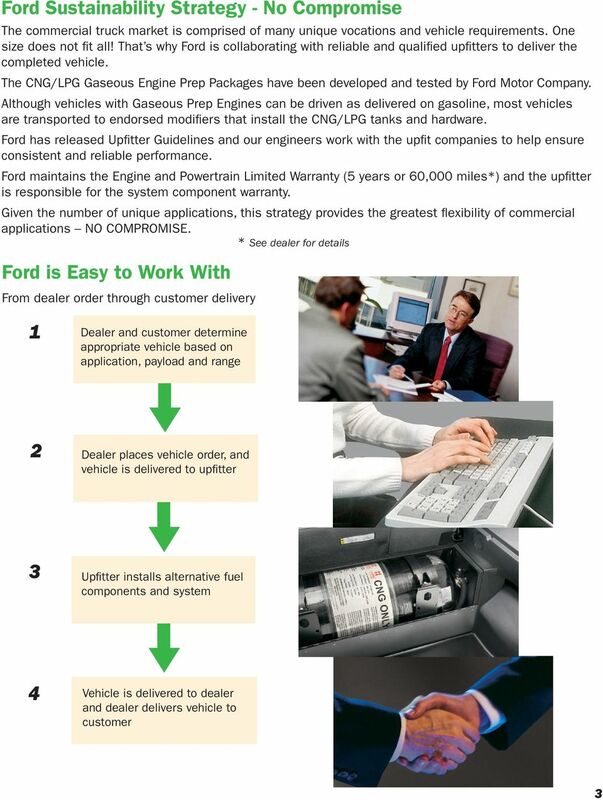 Ford knows your business needs, offering practical solutions that can get your truck ready for real work. 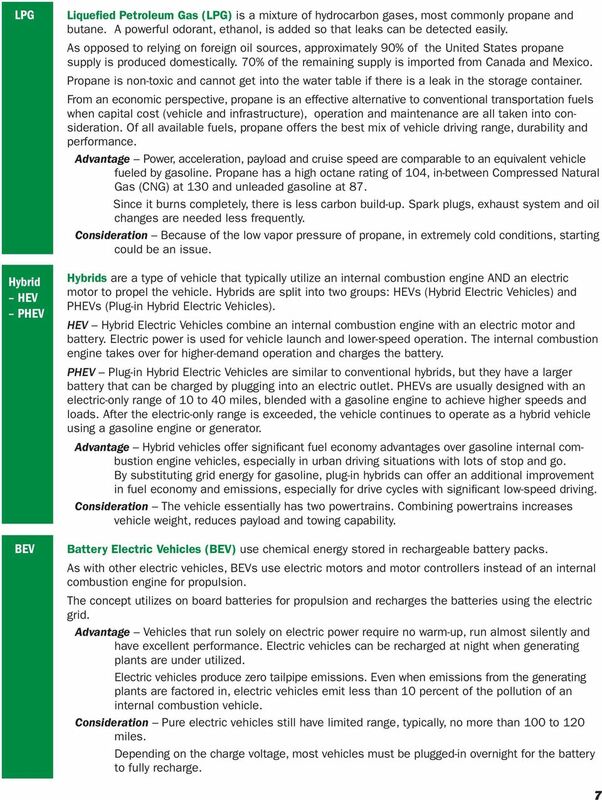 2016 ALTERNATIVE FUEL BUYERS GUIDE COMPRESSED NATURAL GAS PROPANE AUTOGAS BIODIESEL ETHANOL HYBRID PLUG-IN HYBRID ALL-ELECTRIC WHY ALTERNATIVE FUEL IS IMPORTANT TO YOU AND FORD. Reduced carbon footprint. 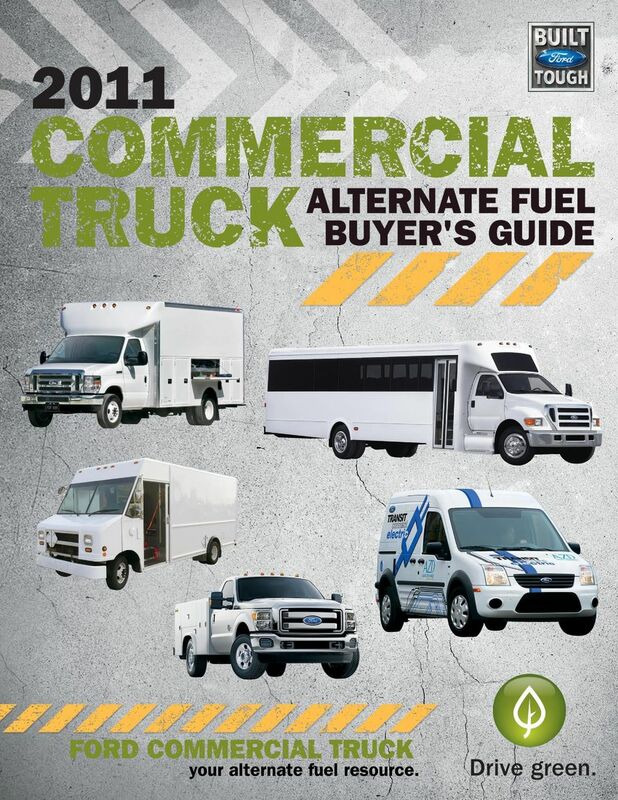 2014 ALTERNATIVE FUEL BUYERS GUIDE WHY ALTERNATIVE FUEL IS IMPORTANT TO YOU AND FORD Reduced carbon footprint. For many businesses, operating a fleet is the single largest contributor to their carbon footprint. 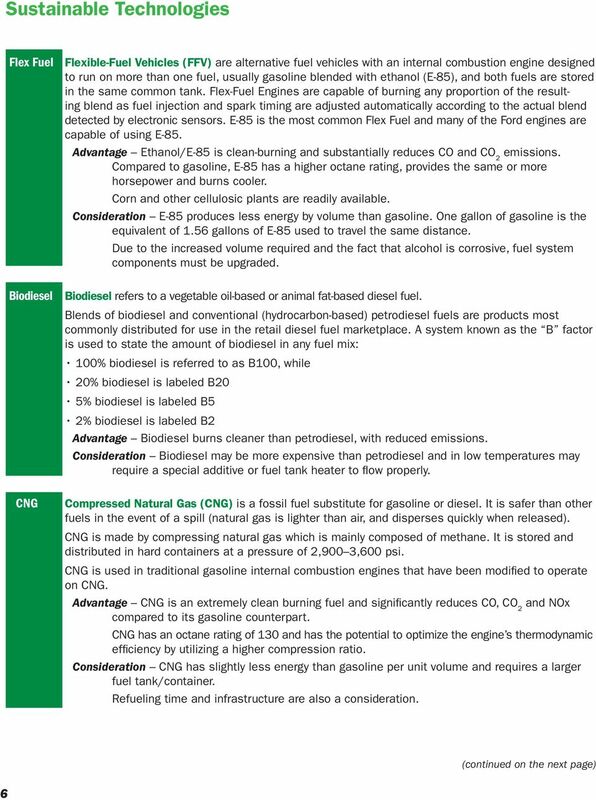 2015 ALTERNATIVE FUEL BUYERS GUIDE COMPRESSED NATURAL GAS PROPANE AUTOGAS BIODIESEL ETHANOL HYBRID PLUG-IN HYBRID ALL-ELECTRIC WHY ALTERNATIVE FUEL IS IMPORTANT TO YOU AND FORD. Reduced carbon footprint. 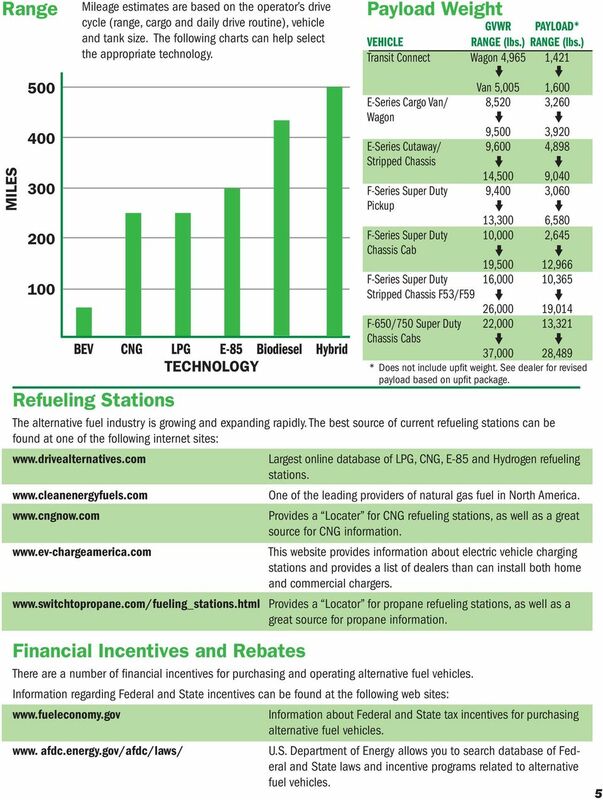 HSU hydrogen Fueling Station and Hydrogen VehicleS Frequently Asked Questions How does the hydrogen fueling station work? The station uses electric power to split water into hydrogen and oxygen gases.